Amy Chen hosted the fifth play test for the History of the Book: The Game. Four library staff played this time: Heidi Wiren Bartlett, the Digital Scholarship and Publishing Studio Designer; Colleen Theisen, Outreach Librarian for Special Collections; Kelly Grogg, senior Olson Graduate Assistant for Special Collections; and Laura Hampton, Digital Project Librarian for Special Collections. Greg Prickman, head of Special Collections, sat in on the play test. While the game is likely going to have a name change at some point in the future, you can continue to follow its development on Twitter by following Amy at @amyhildrethchen or the hashtag #hotb. In the next few weeks, following a short period for a few minor revisions, the game will be available for broader play testing either during the work day or for at-home check out. If you are interested in “checking out” the game, please contact Amy. 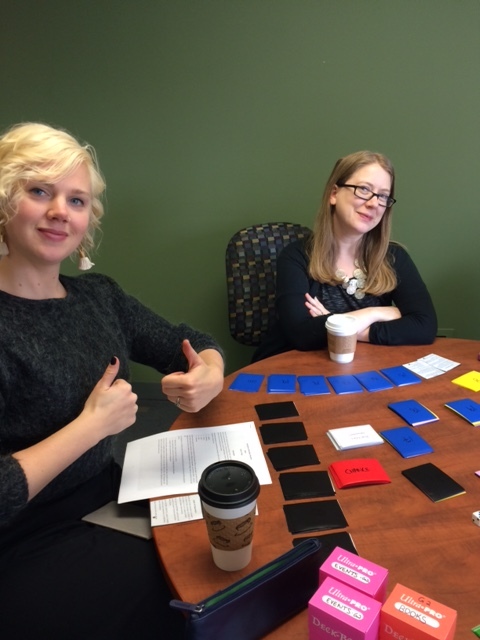 Heidi Wiren Bartlett and Colleen Theisen play History of the Book: The Game.